At the heart of The Laws of Gravity is cord blood - full of potentially life-saving cells. But what is it exactly? Cord blood is the blood left in the umbilical cord and the placenta after a baby is born and the umbilical cord is cut. Typically, this blood is discarded along with the cord and placenta. Cord blood, though, is full of stem cells, which are highly flexible cells that have the potential to become any specialized cell in the body. Because of this they can be used to treat various illnesses and genetic disorders, such as the leukemia that Nicole has in The Laws of Gravity. According to the March of Dimes, over 70 diseases and disorders have been treated with stem cells from cord blood. However, as the March of Dimes also states, cord blood stem cells are primarily used for children who need stem cell transplants because umbilical cords only contain a small amount of blood, which means that each unit of blood collected may not have enough cells to treat adults, or even older children. Cord blood stem cells can be stored and saved for a specific family (such as Ari does for his family) at a private cord bank, or they can be stored and saved at a public cord bank which allows those stem cells to be available to anyone who is a match. The technology for bone marrow transplants has been around for more than 20 years. Stem cells from a healthy bone marrow donor are transplanted into the patient; in essence, the good cells replace the bad. If the transplant is successful, the good stem cells travel within the marrow and reproduce more good cells. But bone marrow stem cells have their limitations because, unlike stem cells from cord blood which are pluripotent (that is the cells can become any other cell in the body - from the Latin for very many and having power), stem cells from bone marrow are only multipotent (Latin: many and having power). This means that they can become any type of blood cell but cannot be used to repair other parts of the body. According to the American Medical Association there is only one other viable option at this time, which is an adult stem cell transplant. 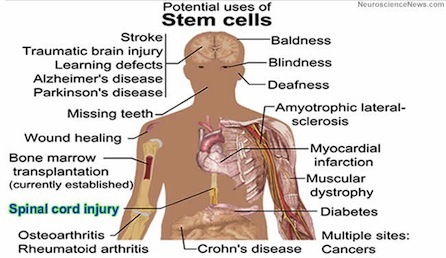 Adult stem cells, or mature stem cells, are cells that are in already existing tissue. With this procedure, adult stem cells, which are also called peripheral blood stem cells, are taken directly from drawn blood. Two key problems with this kind of transplant are that, 1) like with cord blood, the numbers of stem cells in drawn blood are low, and 2) because they are already mature, adult stem cells have a narrower chance of being a perfect match. Embryonic stem cells are in a different category all together as they are truly pluripotent - able to become any cell, or group of cells, in the body - and are not limited in quantity as cells from cord blood are. But research in the USA has been limited due to ethical concerns. Scientists are also looking at ways to genetically reprogram adult cells so that they can act like stem cells. This would be a major advantage on the peripheral blood stem cells and bone marrow transplants discussed earlier as while the genetically reprogrammed adult cells are also multipotent (only have the potential to become certain types of cells), it would seem that it would just be a case of taking the cells from the right part of the body for the needed repair! Another advantage of this technique, if proven viable, is that the cells would be a genetic match to the individual without the ethical issues surrounding embryonic stem cell creation. In a nutshell, each of these methods has its pros and cons. Cord blood and adult stem cell transplants have low stem cell counts. Cord blood banking for private use is expensive, but a good option if you feel that your child, or a sibling, or perhaps, even, another family member, is likely to be in need of a transplant. Bone marrow transplants can be very effective but it is difficult to find a good genetic match and the stem cells can only be used to treat blood related conditions. Embryonic stem cells come with ethical issues, but are very flexible in terms of the kinds of diseases they can treat. Finally, genetically reprogramming adult stem cells and new cutting-edge cloning research are both promising avenues. The field of stem cell research is developing very fast. In May 2013 it was announced that a US team has successfully used the same cloning technique that was used to create Dolly the sheep to turn human skin into embryonic stem cells. This work looks extremely promising as the resulting cells are a genetic match to the patient - but will reignite the ethical questions about the creation and destruction of early stage embryos. And in early 2014, it was announced that scientists at the Japanese research institute RIKEN could be on the way to developing a seemingly extraordinarily simple method to create stem cells - they took blood cells from mice and soaked them in a mildly acidic bath for 30 minutes which caused the cells to revert to pluripotent status (i.e. can be turned into any sort of cell). The cells were then injected into host mice where they transformed into normal cells in the heart, brain and other organs. Make no mistake about it; stem cell research and transplants are here to stay. And they are becoming more mainstream by the minute. Stem cell research can offer exciting life-saving solutions to serious health issues but, at the time of writing, t it is still fraught with social, emotional and political implications and layers as Liz Rosenberg only begins to explore in The Laws of Gravity. This "beyond the book article" relates to The Laws of Gravity. It first ran in the May 22, 2013 issue of BookBrowse Recommends.